We have a mobile Miller Lite beverage kiosk for rent in Las Vegas and Henderson. This is a great rental for bar owners, stadiums, special events, festivals or large gatherings. 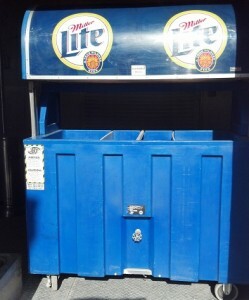 The beer and beverage serving station is NSF approved and has a telescoping Miller Lite canopy. It also features a product shelf, heavy duty wheels for easy mobility and 3 compartments.